We all love a good old fashioned full English breakfast, but how would you like a side of real money with your fry up? This is the Full English promotion from Coral Bingo which is giving every single player the chance to win a sizzling stash of cash. Read on to find out how you could win a share of £1,000. Everyone’s a winner with this promotion. If you’re not lucky enough to be picked in the prize draw then you will still come away with a mystery bonus amount- between £1 and £5- that you can spend anywhere at Coral Bingo. If you like the sound of the Full English offer, all you have to do is sign into Coral Bingo between the 3rd and 16th of April and spend at least £5 in real money on the Full English slot game. Every fiver you spend on this game will earn you one prize draw entry and there is no upper limit to how many times each player can enter. That means that you can keep on playing and enjoying Full English for even better chances of being named a winner. There’s no prizes for guessing what the theme of this slot is! As you can tell, Full English is all about the traditional British breakfast and this slot comes with all the trimmings. Exclusive to the Coral and Gala Bingo sites, Full English is filled with brightly coloured animations of foods that have been brought to life with their own unique personalities; like a grumpy fried egg, smiling sausages and even some Rastafarian beans on toast! There are 20 pay lines across five reels in the game, available to spin from as little as 10p or as much as £500. 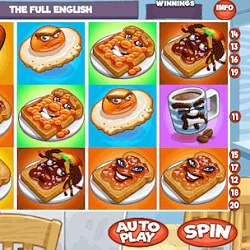 This wide variance makes Full English suitable for just about every type of slot spinner. As well as great gameplay action in the base game, Full English has a brilliant bonus round which is activated by the Full English logo appearing on the first, third and fifth reels at once. During this free spins round, you can win extra spins and massive multipliers by matching up sets of breakfast food symbols. All registered members of Coral Bingo, both new and existing, are welcome to take part in the Full English promotion. The prize draw will be taking place on April 17th. Only gameplay made with real money between the 3rd and 16th of April will qualify for prize draw entries. There is no limit to how many times a player can enter the draw. All winning funds are paid out as real cash, with no wagering requirements, and will be paid into winners’ accounts by 6pm on April 17th. Qualifying players who do not win in the prize draw will also receive their bingo bonus by 6pm on April 17th. This prize in non-withdrawable and is subject to a 2X wagering requirement.